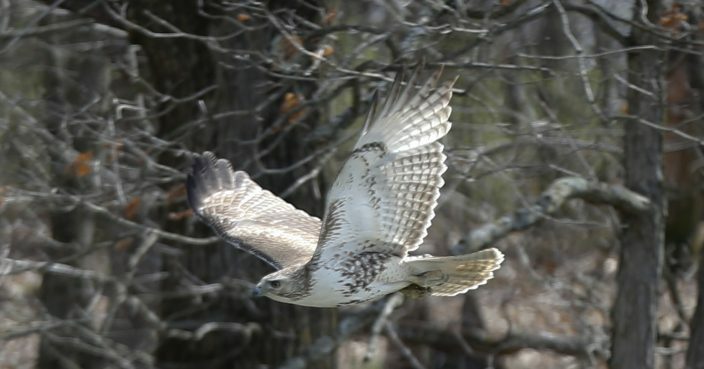 Four years ago, lawmakers made national news by refusing to pass a bill promoted by Hampton Falls fourth-graders designating the red-tailed hawk as the state's official raptor. Opponents called the bill unnecessary and the bird too violent, and one suggested it would make a good mascot for Planned Parenthood because it tears its prey apart, "limb from limb." In contrast to the lengthy debate on coyotes, discussion of the raptor bill was brief. The only lawmaker who spoke against it was Rep. Christy Bartlett, D-Concord, who argued the state already has too many symbols and that red-tailed hawks, being common place across the country, don't uniquely represent the state. Students who want to get involved in the political process would be better off working on bills of greater importance, she argued. "I think this is an opportunity for us to establish a symbol that works for the state of New Hampshire but also a way to pay respect to tenacity and perseverance," he said. Students wore T-shirts that played off the state's motto of "Live Free or Die" that read: "Our Second Try to Live Free & Fly." They argued red-tailed hawks were deserving of the honor because they're determined, adaptable and share parenting responsibilities. Daniel Blankenship, one of the students, who spotted a red-tailed hawk on his way to the Statehouse on Wednesday, said the defeat four years ago was instructive. "It taught us all a lesson that we don't always succeed in getting what we want," he said ahead of Wednesday's vote. "It helped us grow as people." The vote to kill the coyote bill was much closer — 233 to 126. Rep. Wendy Thomas, D-Merrimack, described how coyotes killed her backyard chickens and ran at her daughter one summer. Still, she supported the bill because it would not have affected anyone's ability to trap or kill coyotes to protect property or livestock. "This is a bill that protects the pups," she said. "Even though coyotes killed my chickens, even though coyotes challenged my daughter, I believe they still have the right to have pups and not be hunted when they are having those pups." "Yes, there is no closed season for coyote hunting," said Rep. Kevin Craig, R-Lancaster. "Neither do the coyotes ever take a day off for hunting."